In this edited extract from her new book The Autobiography of Video: The Life and Times of a Memory Technology, Ina Blom examines the memory and history of early analog video, and investigates how the medium, heralding new forms of technological and social life, prehended the forms and forces of painting. ‘Someone started talking about video history: “Video may be the only art form ever to have a history before it had a history.”’1 This is Bill Viola, recalling a dinner scene at Chinese restaurant in New York on a February evening in 1974. Only a few weeks earlier—by most accounts an early date in the history of video art—the Everson Museum in Syracuse had opened the first retrospective exhibition of the work of Nam June Paik, accompanied by a catalogue with Paik’s reprinted notes, letters, and published writings in a messy facsimile format that at once managed to give the impression of instantaneous access to a work in progress and of archival findings attesting to some hallowed moment in the past. At the time, Viola was deeply immersed in questions pertaining to memory. Having spent years focusing almost entirely on technical hardware, he realized he had missed out on ‘the human half of the equation’—notably, human ‘hardware’ such as ‘senses, perception, the brain, memory.’ As part of this new concern, he had been busy trying to trace the process of encoding an image backward, from a stored mental image to a real-time pattern of light—from long-term memory to short-term memory to the working of the retina. In the process, he had come across the phenomenon that psychologists call ‘iconic imagery’, referring to the fact that images are retained by the brain in complete and full detail for as long as a second after their exposure. We assume that these are live images of the world, whereas they are in fact some sort of retention or ‘recording’. For Viola, this opened up new and confusing avenues of thought. Where did memory begin and stimulus end? Were all images always already memories? Was memory actually a future-oriented filter rather than a sense of the past—a process of continual invention at the service of present action? This argument could be grounded in a variety of circumstances. It could indicate the evanescent impact of any technology in an age of rapid media development—the dawning suspicion that video was almost already a thing of the past. It could refer to the presence of a highly self-reflexive media culture, fuelled by off-the-cuff analyses of the here and now by popular figures like Marshall McLuhan and Buckminster Fuller. Or it could point to the sudden emergence of a new and troublesome type of historical archive where ‘information’ equaled ‘overload,’ as represented by the growing stacks of rapidly deteriorating videotapes: ‘a magnetic city dump’ and ‘almost as much of a bother to maintain,’ as Viola put it.3 But none of these ideas really seemed to catch Viola’s imagination. What seemed pressing to him, what in fact pressed itself on him and appeared to speak through him and others, was a more limited technical feature. To describe this feature, the temporal linearity of everyday language would have to be circumvented; hence, Viola called it ‘recording-simultaneously seeing-instantly playing-back.’4 The expression referred to the fact that signal transfer in video is always a live force, even when triggered by magnetic recording, and the (related) fact that images may be produced in a feedback loop between camera and monitor without recourse to recording on a magnetic support. Video quite simply seemed to blur the distinction between the forces of stimulus and retention, or an event and its representation. In fact, in a January 8, 1972, letter to Radical Software, published in the Everson Museum catalogue, Paik pointed out exactly this. In this retrospective context he underscored video’s problematic relation to history: ‘The word history came into being, because our events were told and written down thereafter. Now history is being recorded in image or video. Therefore, from now on there is no more history but only Imagery or Videory.’5 Memory, in video, was simply a question of an imperceptible time delay, a minimal difference between before and after that is simply an internal feature of machinic functioning. This entirely general feature, present in all video regardless of brand or generations of machine models, seemed to imbue video with the instant reflexivity of cognitive systems. Hence the intuition that video had agency—a capacity for active perception of other objects in the world, which became part of video’s progressive self-definition or individuation. Hence, also, the intuition that video was a self-recording system—that is, a system whose memory or history ran ahead of it, so that video history could not be configured in terms of the conceptual distinction between the lifespan of an object and its subsequent status as an archival object or record of history. What exactly was this thing called video? What determined its existence? Such a point of view might put any newly minted video artist on the alert. At the moment when a number of institutional forces conjoined to affirm the artistic and technical expertise invested in video, the constitutional heterogeneity of this technology also seemed to assert itself. If video was the first art form or artistic medium to be always already historical, if it made history emerge as a technology of memory at odds with the technical affordances of video, then what exactly was this thing called video? What determined its existence? Television?  Electronic sound experiments? Radar? Visual art? Computer technology? Could it even be called a medium and, if so, under what circumstances did ‘it’ appear as such? What affected video to affect itself? Several artists and art historians have identified connections between postwar abstract painting and the interest in specific features of televisual technologies and media. Formalist impulses in modern art—emphasis on the essence of painting—appear in sympathy with the early view of television as an empty medium, one whose message was indeed the medium itself.6 More socially and politically oriented tendencies in television and video art mainly seem to emerge with the somewhat later awareness of the ideological impact of television—the notion that television did in fact have ‘content,’ and that this content is political manipulation as well as a spectacle through which audiences, as Richard Serra put it, are ‘delivered’ to advertisers.7 For all its pertinence, this is in many ways also a centripetal reading of television and video art. It places video in history and as an artistic medium by distinguishing it from the television art that preceded it, and by providing an account of these distinctions via the complexes and variations of form and medium specificity that first united painting and television. The abstract-modernist quest for formal invention in painting validates experiments with the specific properties of electronic image technologies (for instance, the radar technologies used by the German painter Karl-Otto Götz) by placing such experiments firmly within the sphere of culture. At the same time, inspired references to key televisual features, such as transmission, liveness, and broad reach give a techno-scientific grounding to specifically painterly concerns in European postwar art (mainly in the work of the informel painters and the Zero movement artists).8 Through such associations, an aura of technicity attached itself to the work of artists who did not yet have access to televisual technologies. Painterly and televisual forms and procedures are then allied either through associations that give both a new historical/cultural and aesthetic dimension, or through the identification of structural similarities that set new critical standards for art in the media age. But these scenarios also mean that analyses of video’s more direct implication in social and political thought come to depend on the idea of an initial and foundational centering on issues of medium specificity and form. Such identification of historical stages in television’s reception in culture underpins a well-established dividing line within the field of video art in the 1970s—one made in the name of media politics and social reflection. On the one hand, you have the painter-engineers who pursue their quest for new electronic imagery by creating video synthesizers, multikeyers, and sequencers, exploring and expanding on a repertoire of technical and formal effects, and, on the other hand, you have the artists who primarily access video for the purposes of media critique and political intervention.9 Yet neither the dialectics of media essentialism and its politicized other, nor the historical positioning of video after television art may provide the epistemological frameworks through which video’s role in the reformulation of social memory will come into view. If video is the portent of a post-historical ontology, this necessarily impacts its historiography, its organization of memory. Paik’s and Viola’s intuitions about video’s undoing of the historical order of events may, in other words, open up a less-centered view of video’s coming into being. 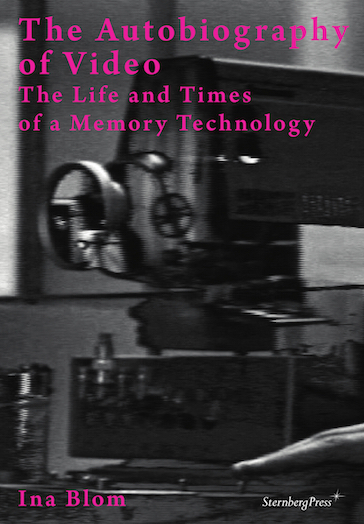 And to the extent that memory is by definition social, a reflexive exploration of the capacities of a memory technology is no less so; from such a perspective, early video’s implication in sociopolitical issues may be seen as more widely distributed than is currently the case. Through video it becomes retrospectively possible, for instance, to see how certain ‘videomatic’ inscriptions of social memory traverse material and temporal contexts that exceed those of video ‘proper’. In contrast to the history of video and painting, then, is video’s prehension of painting. Video appropriates a particular type of painting/memory that now presents itself as already video, video’s history before history, the image of an event that has not yet been perceived. Such video-prehension may be traced in retrospect since it is not the internal secret of some hidden video mind or psychology but the effect of concrete associations or encounters that have left distinct material marks. They may be chaotic (like Paik’s archive/catalogue), they may be dispersed and fragmentary—but they are traceable all the same. Traces of video’s prehension of painting can be found in the work of various participants of the international Zero movement—with the proviso that the overarching emphasis on the association between painterly and televisual formal concerns is put to the side for the moment being. In his description of working with the directed electron ray of radar technology, Karl-Otto Götz used the painterly language of form, speaking of ‘representation of forms of all kinds’ and ‘making forms visible on a luminescent layer.’13 Yet in the context of the Zero movement, a different painterly language also emerges. It is hard to avoid noticing that the term deployed over and over again by key figures such as Otto Piene, Heinz Mack, and Günther Uecker is force rather than form, and that force is often used to militate against central tenets of formalist/modernist painting. At times, the artists seem to eschew not just the discourse of formalist reflexivity but also its anthropocentric appeal. Against the modernist emphasis on a pure, abstract visuality that will make a human spectator conscious of his or her activity of seeing, a distinctly nonhuman technicity seems to install itself at the heart of painting. Initially, however, this might not seem to be the case. On first view, much of the Zero output appears vested in the idea of the flat picture surface as a screen, where elements are distributed in repetitive all-over patterns as if to further entrench the idea of the purely optical screen in modern abstract painting. If such works were, on the one hand, starkly material—just marked canvases—they also engaged the spectator’s eye in the production of shimmering instances of unadulterated seeing. This was what a brilliant critic like Clement Greenberg took from the impressionist legacy in painting and what made him see the work of Jackson Pollock as the affirmation of the very essence of modern painting.14 Given a slight push in a more explicitly technical/optical direction, however, modernist visibility at its most dynamic might also be associated with television viewing. Photographic documentation from influential Zero exhibitions, such as the 1959 exhibition ‘Vision in Motion’ at the Hessenhuis in Antwerp or the 1962 exhibition at forum 62 in Ghent, shows picture screen after picture screen freely distributed in furniture-like arrangements throughout the spaces rather than hanging on the wall. Screens, filled with dense scan lines or raster patterns of tiny dots, were suspended from the ceiling or standing on metal rods, as if to recall both the television set in all its thing-like commoditized glory, and the optical effects produced by its luminous emanations. Even so, Piene seems to argue against this easy identification between television and painting. Or, to be more precise, he has little patience with the modernist focus on the image-spectator symbiosis that found both its fulfillment and its parody in the concept of the television viewer chained to his dynamic screen. Denouncing a world where the viewer is ‘forced into the picture, pressed as though through a tube’ (his choice of words) is that of someone rising up against a system of incarceration. Pictures are no longer ‘dungeons where mind and body are shackled together’; they are ‘mirrors whose powers affect man.’15 One is clearly invited to think alongside Piene’s use of all sorts of reflective surfaces that catch and distribute wild light effects and not the idea of the picture as a mirror of reality. For such powers seem to deploy themselves beyond the frame of the image: they ‘stream freely, pouring forth into space’ rather than addressing the spectator eye specifically. Here they attest to an economy of abundance, alien to all notions of limitation and restraint: ‘not ebbing but flooding.’16 The effusive romanticism of Piene’s wording makes it easy to ignore the more systematic aspects of his reasoning, which revolves around the concept of force. Painting is, for instance, defined in terms of forces that attest to an ‘undisturbed energetic continuum’—a series of his 1958/59 paintings were even entitled ‘La Force Pure.’17 Similar ideas expressed by Heinz Mack advised against the use of large units of form and all sorts of compositional and structuring strategies, since they ‘cannot become the force of continuous motion.’18 This principle has consequences for the use of color: to set one color in contrast to another may intensify the first, but also restrict its freedom because there is a governing relationship between the degrees of intensity and dependence. What Mack calls ‘the virtual objectification’ of a color, or its ‘intrinsic energy,’ is only released when it ‘strikes its own vibration.’19 Colors are essentially vibrations or frequencies and hence one color may represent all, since difference in color is a matter of potential frequency modulation. Piene, for his part, sees the vibratory activity of frequencies and frequency modulation as a new art of nuance, far removed from broad-scale structures of contrast, tragedy and drama—the ‘life-blood of color’ and the ‘pulse of light’ is pure emotion and pure energy. ‘Force,’ ‘frequency,’ ‘energetic continuum’: this is and is not the terminology of broadcast television. The terms seem, above all, to represent a more partial technological perspective that was shared by television and video, but that took on a more independent status as video. This is, more precisely, the vocabulary describing the working of the video camera’s pickup tube—a vacuum tube using a focused beam of electrons in order to continuously convert optical images or uncoded streams of light frequencies into electrical signals of varying voltages, ready to be carried by cables, recorded on videotape, or transmitted through the air. These signals may also be converted back into light if their electrical energy is used to power an electron gun in a monitor: as streams of electrons are sent to the face of the picture tube in the monitor they cause chemical phosphors in the inside face of the tube to glow with an intensity that is directly proportional to the continuously changing amounts of voltage. It is, in addition, the language of the video synthesizers developed in the late 1960’s, said to produce ‘electronic painting’ since they allowed free modulation of color frequencies and scanning patterns. Leonardo, Picasso, Renoir, Mondrian, Pollock, and Jasper Johns were all evoked to explain the versatility of the new color TV synthesizer, introduced by Paik and Shuya Abe in 1969.20 If one takes seriously all the talk of forces and frequencies, the canvases of Piene and Mack now come across as relays providing the breaks or constraints necessary for the transformation of movement, from one state of intensity to another. They handle the variable intensities of monochrome color—modulated by dense arrays of protruding nails, for instance—or the transformation from uncoded to coded streams of light that takes place when light from moving torches or electrical lamps is sifted through perforated surfaces of various kinds. Or they evoke the concept of electronic tactility, with pixel-like traces of smoke marking a canvas, a residue of fire meeting paint through a metal raster. And these are just a few of the numerous acts of tearing, slashing, shooting, stretching, suspending, pinning, layering, perforating, and burning the canvas that marks the work of the Zero-related artists in Germany, Italy, and elsewhere. What video prehends here, above all, is painting as a technical agent producing affects. This has relatively little to do with the formal structuring of painting, however expansive. 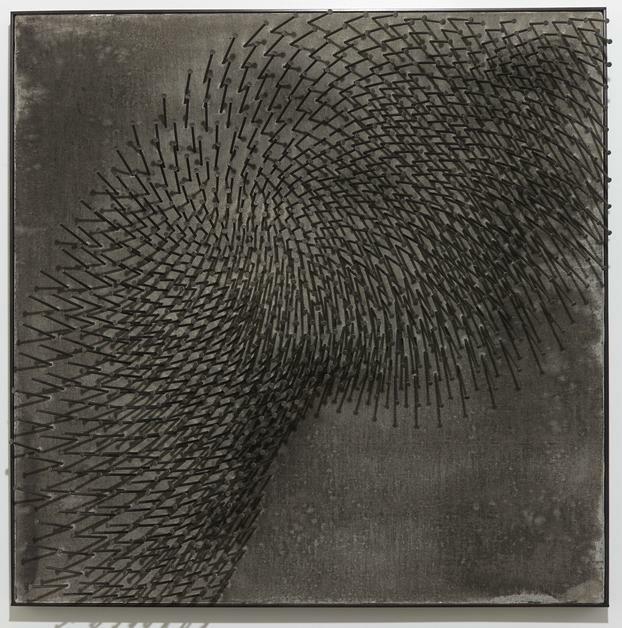 Günther Uecker seems marked by such a perspective. He may fill his canvases with dense, pixel-like arrays of nails—often painted white—but he does not want them to be seen as nails or as parts of a structure. If they are placed in an ordered relationship to each other, this is simply to better set them vibrating and thereby disturb or confuse their geometrical order. In fact, the traditional rectangular pictorial formats of the Zero group paintings is the element that video prehension most efficiently forgets or filters out. Or else it reinterprets these formats as passageways or ‘light sluices’ (as indicated in the title of a 1962 work by Adolf Luther)—as mediators; that is, not image planes. Soon enough Piene and Mack and others in the Zero circle try to forget about these formats too, as they go on to work with light effects in the sky or reflections in the desert, with crowds of people, stretches of silver foil, balloons, TV teams, studio equipment. But a signal-oriented memory of the forces of painting precedes the efforts of the Zero group in the late 1950s by at least a half-century. For video also seems to prehend those instances of modern painting that explore the affective dimensions of pure color—the pure color that has been understood as the regulative idea of modern painting.21 At least, such a perspective becomes possible once we accept that in some prominent instances the intensive color experiments of modern art posited painting as a form of mental processing evoking brain functions and brain environments rather than the realm of pure optics and form, as traditional art history would have it. To describe an image is as an agent of exchange and a ‘space between’ is to reject the formalist notion of the image as a unified optical plane. This is a rejection that video enacts over and over again as it carves out a place for itself in the sphere of visual art. But this is just the start. There is more at stake in the process of becoming video or inventing video memory. Video may have appropriated painting for a certain discourse on color as light and light as both spectacular media effect and psychophysiological affect. It may have identified with an ambient painting vested in a science of light, which also gestured toward electrical, photochemical, and electronic technologies. Yet at the very moment when video seems to ‘be’ light and color-frequency modulation—anchored in a nascent history of light media in art—the question of light loses some of its self-evidence. Light becomes complicated and is increasingly mediated in terms of a more fundamental darkness. This is one of the key marks of video’s memory of painting and it can be traced in the work of American artist Aldo Tambellini, a close collaborator of Piene, whose obsession with darkness spanned every available technology of light, from painting to slide projections, film, television, and video. In the postwar media age, light was the optimistic keyword for a new ambient and hallucinatory art, an art of light shows and media environments that gathered popular audiences under the promise of mind-expanding experiences. Against the ‘capitalist realism’ of commodity-oriented Pop art and its creation of a host of new art stars, light art promised new forms of communal being through hallucinatory modulations of the senses. Yet the ambiguity of these promises—was this not just a more insidious capitalist spectacle?—was exposed once video stopped taking light itself for granted. Questioning light, then, meant reconsidering the very terms of collectivity and sociality. At this point, video’s identification as a new modality of social memory is also seen in its political dimension. The work named Zur Geschichte des Lichts (On the History of Light) might, for instance, be understood as an explicit nod to this modern tradition of light art, revived and expanded on in an era of increasing affluence, electrification, and mediatization. Yet the work lacks all the ambient qualities that would make such a reference intuitive. A layer of gold paint—pressed through a metal raster as if to emphasize the strangeness of the chain of associations that connects oil paint straight from the tube with light, signals, and frequencies—sits atop a layer of black paint, which also forms the outer edges of the picture. The effect is dense, thick, and emphatically ‘material’—a painting-object rather than an image. But then its title may also be read as a question pertaining to the nature of material things, such as particles and waveforms, and not just the history of light in art. In what sense can a photon, the quantum of light and all other forms of electromagnetic radiation, be said to have a history? What is that thing called light, anyway? A 1966 text signed by Piene, Mack, and Uecker, pursues this deliberately naive line of questioning by turning history into biography, demanding to know how old light is, where it comes from, and who first saw it. Light is at once material object and quasi-subject: questions about its price (per kilo) and ownership is followed by inquiries about how it dresses, bathes, sleeps, with whom it sleeps, and whether or not it suffers from photophobia. The idealist strains in Piene’s romantic art-speak and his enthusiasm for everything ‘immaterial’ is countered by a radically materialist orientation that acknowledges the autonomous properties of light, irrespective of human perception and ideation.25 For it is along the same line of inquiry that Piene displaces the centrality of the two sources of light that confirm the priority of the human eye and the human perspective: notably, the sun and the moon. Once the language of frequencies invades the sphere of art, art aligns itself with a nonhuman realm of physics in which you have to contend with the fact that there is not one sun and one moon but many—in fact, a rapidly expanding universe of luminous objects, as Edwin Hubble discovered in 1929. The author of the last statement is Aldo Tambellini. The first performance of The Proliferation of the Sun took place as part of the performance program he organized, together with Piene, at his own Black Gate Theatre on the Lower East Side in New York. In the program notes, Tambellini writes that the concept of proliferating suns was above all associated with ‘blackout’—one of many metaphors for his preoccupation with a darkness that was so fundamental it made light seem like a local incidence—a minor effect rather than a new material foundation for art. Like the Zero artists, Tambellini’s interest in the realm of frequencies and electronics grew out of a painterly practice that emphasized force over form, energy over structure. And like the Zero artists, his endeavors in painting were centered on circular shapes and movements that seemed to penetrate the painted surface: pulsating deep black circles or cell-like spheres. In the context of nascent media art, Tambellini’s activities gained momentum through a deeply counterintuitive move. The fact that television, film, and photography are generally understood as technologies of light—associated with modern illuminated environments and the steady quest for enhanced visibility—did not stop him from suggesting that darkness (i.e., blackness) is a more fundamental and thus also more critically valid point of departure. And with this suggestion, which extends from his early enamel paintings of circular black shapes through all manner of destructions and perforations of painterly surfaces to the use of film, slide projections and—finally—video, a whole ontology of light is displaced. In this ontology, light figures as the physical and metaphorical grounding of human cognition, the premise of our ability to survey territories, to recognize, distinguish, memorize, and represent. While sunlight supports the normal working of the human eye, the technological accessing of long-unperceived sections of the electromagnetic spectrum radically expanded the range and concept of visibility itself. Thanks to new instruments, more power was given to human vision; hence the centrality of the term ‘electromagnetic spectrum’ for artists in the 1950s and ’60s—focused as they were on the aesthetic and artistic implications of a transformation of vision that seemed to produce not just new electronic bodies but new ways of knowing and thinking. The rather large and unwieldy White Light Mill that Piene, Mack, and Uecker created together in 1964 underscores the discrepancy between the visible bulk of technical apparatuses (the huge TV cabinets in private homes) and the ephemeral and invisible phenomena they open on to. In the world of science, a light mill (or radiometer) is a glass bulb with a partial vacuum, inside of which a set of vanes mounted on a spindle rotate when exposed to light: the speed of rotation provides a quantitative measurement of the intensity of electromagnetic radiation. 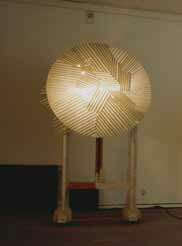 In the world of art, however, a ‘light mill’ could simply be used as a way to think about the unseen forces of light. 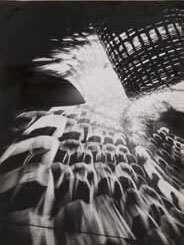 Three decades earlier, Berlin Dadaist and electronic experimenter Raoul Hausmann had done just that when he took the term Lichtmühle as the title for a 1931 black-and-white photograph of new and surprising patterns that emerge when light sifted through the ‘raster’ of a straw wastebasket hits a photosensitive surface. From this perspective, it is obviously striking that one of the pioneers of media art, and a close ally of the Zero group, based his entire production on a rejection of the centrality of light and a lumiocentric ontology vested in the expansion of human knowledge and power. In Retracing Black, a 2012 restaging of Tambellini’s early multimedia installations at Tate Modern in London, everything revolved around darkness. What little light there was seemed to emerge from within black space and to be sucked back into that space before any impressions were allowed to form. A triple-screen film projection showed rapid-fire sequences of a huge variety of circular shapes interspersed with stretches of celluloid that had been scratched, painted, burned, and exposed; interpolated into this material were various types of home-movie documents and found footage, mainly evoking urban scenes and media-related materials. Nothing was offered for contemplation—everything was subjected to a form of flickering, which came across as the permutations and accidents of darkness rather than the ubiquitous ‘play of light’ of avant-garde media experimentation. 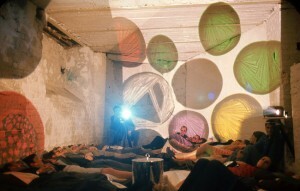 Tambellini’s so-called Lumagram slide projections onto the walls and floor allowed a huge variety of rounded cell-like forms to emerge, only to fade to black as soon as you tried to actually see them. In fact, it was as if everything—including the hand-painted 35 mm slides that form the basis of the slide projections—was handled at the too-rapid speed of signals. Around the time of the Black Gate Theatre series, Tambellini had also started his first experiments with video technology. By manipulating the internal circuits of the cathode-ray tube of a television set, he was able to produce spiraling forms that emphasized television as a medium in which the image is simply a function of one specific set of controls—one that just happens to be more rigidly enforced than others, thanks to the decisions of manufacturers and standards boards. The speed of signals is the more fundamental fact of video, not the legible image. And in the video works that that were included in spatial ensembles, such as Retracing Black, the swift emergence and disappearance of circular forms, televisual outtakes, and general electronic noise explicitly attest to wild powers at work, as liable to tear through the darkness with a thumping, piercing sound as with blinding flashes of light. Tambellini was not entirely alone in his quest for ‘black media’ ontology. In a text titled Mélanographie (1968), Hausmann expounded a theory of photography that located the generative, productive moment of photography not in its famous ‘writing with light’ but in its automatic and uncontrollable production of black shadows. Here was an active instance of difference within within the photographic image that would forever prohibit its stabilization.27 However, in Tambellini’s work the question of psychophysiological forces and the feedback between environment and mental processing is for the first time explicitly formulated as a question of social forces. His black media ontology was directly associated with the social and political upheavals of the ’60s, most notably the civil rights movements and a concomitant cultural impulse: the reclamation of blackness both as an identity to be celebrated and as a positive aesthetic term. His life on the Lower East Side included close collaboration with a group of black poets associated with Umbra magazine. The voice and words of its editor, Calvin Hernton, feature prominently in the deafening sound materials of Tambellini’s multimedia environments. And when human faces flicker past in Tambellini’s films and videos, they are more often than not African-American faces shot in stark, high-contrast black and white, which allows facial traits to become lost in an expanding realm of darkness, as if in a head-on refutation of the supposed problem of photographing black skin. Through such gestures of flickering and visual dissolution, Tambellini attempted to indicate other ways of imagining a social world. In fact, this is precisely where Tambellini’s strategic foregrounding of darkness as a marginalized zone of non-knowledge becomes critically acute. To be white is to have visibility, and to be seen is to be known: such is the self-assured perceptual/social operation that has delimited and protected its realm so effectively and for so long. Tambellini’s exposition of the very logic of racism may have traits in common with the key argument in Black Skin White Masks, Frantz Fanon’s famous critique of the way in which blackness was always (negatively) defined in relation to white identity and white culture—a relation so entrenched, Fanon complained, that it had come to structure black subjectivity itself.28 For someone concerned with the question of visibility and light, it might seem that a possible antidote to this division and stratification of the social field would be a more modest view of the reach and grasp of human vision itself, even in its most technologically enhanced states. The explicit association between blackness and signal speed is key here, for it is through this association that blackness and darkness escape being pinned down as qualities or identities locked in a static, formal relation to white and light. 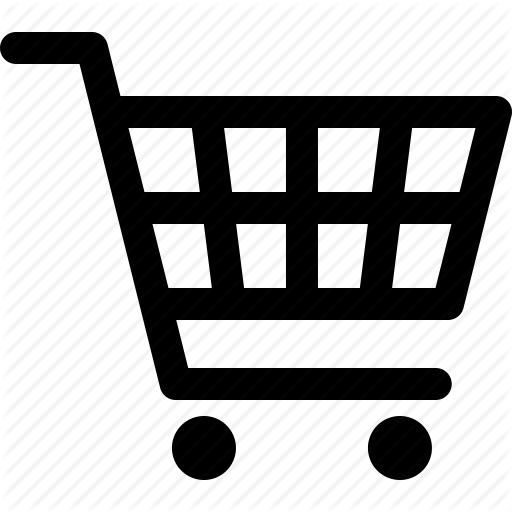 For Tambellini, blackness was a mobile, differential condition with multiple registers, and one of these was as a figure of de-essentialization and suspension in which signals (for example, the socially constructed signals that produce the concept of race) can never rigidly cohere into an image. The late ’60s and early ’70s saw the first evidence of the existence of so-called dark matter and dark energy—to cite the puzzling scientific names given to a type of matter that neither emits nor absorbs electromagnetic radiation, and whose existence can only be inferred from its gravitational effects on visible matter and radiation. Today we know that we are blind to 96 percent of all matter and energy in the universe—it is simply beyond the range of our current technologies of vision and measurement.29 The beloved electromagnetic spectrum of the early video artists—at times seen as a portent of a new ‘cosmic consciousness’ (a universe made human)—could, in other words, also come to represent the severe limitations of human vision and cognition. 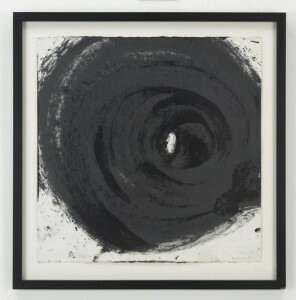 Darkness offered a dynamic corrective to human expansionism and control—and Tambellini’s technology-driven interest in the larger field of astrophysics and space research may have led him in the direction of intuitions that resonates in more recent artistic explorations of a world beyond light and its implications for aesthetic practice and reflection. These experiences were presented to the general public in the 1953 book The Living Brain, where Grey Walter argued that they were not the result of the properties of light or of the mechanism of the eye but of the brain itself. Thanks to this book, flickering and “neuronal modulation” became a guiding concept in an avant-garde culture already invested in self-transformation and alternative modes of collective being. One tangible result was Gysin’s Dream Machines, lamp-like structures with a revolving perforated screen that produced stroboscopic light effects; hallucinatory experiences would occur when viewed up close. Another was the 1965 film The Flicker by Conrad, a musical composer, who understood stroboscopic effects as form of subharmonic production generated without recourse to sound. Medical electronics and art is still widely apart, but these two fields can also change each other’s fruits, e.g. various signals can be fed to many parts of head, brain, and bodies, aiming to establish s completely new genre of DIRECT-CONTACT-ART, and this artistic experiment can bring some scientific by-product for this young science in electro-anesthesia, electro-visual tranquilizer, electronic hallucination through the film for closed eyes, electro-sleep and other electro-therapy. Indeed, how exactly would a television broadcast come across if the TV studio were to be illuminated with flickering light instead of its usual bright studio lamps? And could television—a site of media production that is based on the precise technical control of time patterns—be understood as a brain of sorts, and thus also as the potential site of ‘wild brainstorms’? 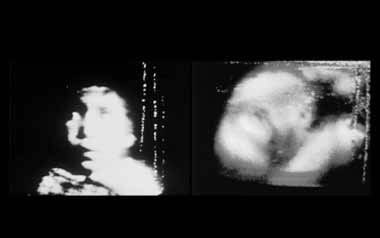 Tambellini and Piene attempted to find out: Black Gate Cologne was an exercise in advanced flickering that reconfigured not just the look of the broadcast image and the concept of TV viewing, but—even more pertinently—the concept of media collectivity. But such televisual self-enclosure was taken to far more intensive levels. The studio turned into a pulsating space, its architectonics increasingly indistinguishable from the electronic effects offered by video technologies. Visual layers multiplied as the space filled up with people. Throbbing electronic soundscapes alternated with sounds of the audience only, as the black-and-white image constantly shifted from positive to negative in sync with cameras zooming in and out on circular light projections on the wall. The shift was emphasized by the increase in sonic intensity, the whirring of film projectors adding urgency to flapping helicopter-like noises that set nerves on end. Soon, the pulsating rhythms turned into full flickering. And the flickering within the studio space seemed to extend to the broadcast image itself, as if Grey Walter’s hypothesis about interferences in the televisual scanning mechanism caused by flickering studio light had actually been proven true. In actual fact, there was no such technical connection between the different levels of flickering. The extension of visual disturbances from studio space to broadcast image was a controlled construction—an effect, apparently, of a desire to subsume the human world of the studio space under a general principle of frequency modulation, to refuse this world its habitual recourse to image and representation. In fact, Piene and Tambellini made sure that the concept of a recording of a social event—the normal framework of most TV shows—was complicated right from the start. This may be the reason why two consecutive studio recordings were made, each with a different audience, and why the two were subsequently copied, one on top of the other. The effect was not just a blurring of all known spatial coordinates, the creation of an entirely synthetic media space. It also implied interference between two time patterns—recalling Grey Walter’s hypothesis about the technical basis for hallucinatory disturbances caused by flickering. This closed-off, self-involved studio shares certain structural features with the closed-off machine-body feedback system of Eaton’s biomusic. The flickering on the broadcast tape is a warning to TV viewers about transmission dysfunction: due to some internal goings-on in the technical setup itself, there is, apparently, nothing to see. Hence, the program is less an ‘emission’ to be shared than a feedback system centered on the studio production site itself. This site—where the studio lights obstruct normal vision, where sound is caught in reverberating feedback patterns, and where people are milling about aimlessly (an unruly crowd rather than the formatted audience of official television)—is both the precondition for production and the thing that is being produced. This studio, with its people, technical affordances, and architectural arrangements, might be called a collective of sorts—a collective formatted by feedback technologies that engaged bodies at the level of constantly changing physiological and psychological states.43 This collective is clearly different from the media age ‘mass’ whose self-representation (according to Walter Benjamin) is the mass-reproduced image.44 No such representation is found in Black Gate Cologne. The theatrical model of televisual programming (most notably the talk show) and its relation to spatial conceptions of the public sphere as an “arena” of debate and struggle, has disappeared.45 This particular televisual collective, which only appears through blinding flashes of light, is defined in terms of sub-individual and supra-individual mobilizations caused by sensory onslaught—presented, that is, through a demonstratively brutal jump-cut to the type of ‘neuronal’ instabilities that must be taken into account once a wider register of human sensorial capacities invades social theory. This entails attention to the way in which sensorial apparatuses construct and interact with an emergent world, a biological perspective that may impact social ontology and political thought as well. It is significant, of course, that the flickering in Black Gate Cologne is not just an abstract play of light, as in the work of Conrad and Kubelka, but laced with the kind of TV news footage that would (in the TV parlance of the day) be flickering across the screens in every home. The footage was mainly related to the 1968 assassination of Robert Kennedy and to the Black Panther movement that erupted on the US political scene in 1967/68—related, that is, to the radicalization of the civil rights movement, the escalation of Israel/Arab hostilities, and the paranoia caused by mounting suspicion of CIA intervention in US politics. This politically supercharged material was used in a way that produced associations between television and flickering in the most literal sense of the word (i.e., as stroboscopic disturbances that would occasion temporary transformations in the functioning of the brain). The strongly emotional character of the footage, underscored by a dense soundtrack of screaming, sirens, agitated speech, and sloganeering, was so to speak identified with the direct sensorial onslaught of television. The rage, paranoia, and hysteria it elicited were quite simply presented as the specific content of the affective modulation of a properly televisual collective in 1969. In the context of media art, such a shift in social imagination emerges not just with the displacement of representation as a regulative framework for art production but, as importantly, by a displacement of the formalist emphasis in much so-called nonrepresentational art. In contrast to macroscopic and economistic theories of the interrelation between art, the social, and the political, attention to the sensorial triggering capacities of basic materials held promises of more finely grained approaches. The psychophysiological charge of colors, light, darkness, and all sorts of rhythmic patterns and temporal contractions provided the basis for a more microscopic understanding of collective and political bodies and their emergent properties. Against the macroscopic understanding of art’s place in collective memory (as representation: image and monument), the intersection of painting and television may be seen as an effort to think social memory in terms of dynamic processes of differentiation and individuation. This was what was at stake in the painterly prehension of video—at least to the extent that video would soon present itself as a technical framework for the modulation of life itself. The Autobiography of Video is published by Sternberg Press. B. Viola, Reasons for Knocking at an Empty House (Cambridge, MA: MIT Press, 1995), 123. N.J. Paik, ‘Letter to Radical Software’, in Videa ‘n’ Videology 1959–1973, exhibition catalogue (Syracuse, NY: Everson Museum of Art, 1974), unpaginated. Raymond Williams, quoted by C. Mehring in ‘Television Art’s Abstract Starts: Europe circa 1944–1969,’ October 125 (2008), 29–64: 30. Raymond Williams has discussed the early view of television as an empty medium in his book Television: Technology and Cultural Form. See Serra’s short film Television Delivers People (1973). In ‘Fontana’s Atomic Age Abstraction: The Spatial Concepts and the Television Manifesto’ (October 124 , 137–156), Jaleh Mansoor gives an account of Lucio Fontana’s investment in television that foregrounds his ‘televisual abstraction’ as directly politically motivated and thus an exception to the painterly/formalist engagement in TV technologies. Far from being a purely self-reflexive formal enterprise, his televisually informed abstraction is seen as an attempt at collective reception in the face of historical crisis. While Fontana is interested in transmission, and associates television with spatial conquest and transcendence of materiality, his strategies are marked by negation. His cuts in the canvas not only rupture the painterly surface as space for perceptual experience (the basic play of figure versus ground), but indicate television’s status as an ‘internally split mechanism under perceptual duress.’ His statements on the impossibility of painting after the atomic bomb are related to the 1952 television presentation of the Hiroshima and Nagasaki bombings. This dividing line is discussed in Paul Ryan’s ‘A Genealogy of Video,’ Leonardo 21:1 (1988), 39–44. Here Ryan makes a distinction between processing signals for ‘surface of the screen’ and using them as parts of a ‘communication system.’ The question of formalism and the institutionalization of video art versus political engagement is also present, if from within a wider purview, in M. Rosler, ‘Video: Shedding the Utopian Moment’ (in D. Hall and S. J. Fifer, Illuminating Video [New York: Aperture, 1990], 31–50). The work of Juan Downey, for instance, might provide a point of departure for a discussion of video’s prehension of architecture. A.N. Whitehead, Process and Reality: An Essay in Cosmology (New York: Free Press/Macmillian, 1978). In ‘Whitehead’s Revolutionary Concept of Prehension,’ (International Philosophical Quarterly 19:3 , 253–263) Charles Hartshorne makes two assertions of particular importance to my analysis: One is that prehending subjects ‘cannot be things or persons as identical through change; they can only be momentary states, single instances of becoming. In memory it is not A remembering the identical A, it is an experience remembering earlier, and definitely not identical experiences. Only an event language can avoid confusion in a theory of relations’ (259–60). The second is that ‘the idea of prehension is infinitely more abstract and general than the idea of human feelings. […] The more imaginative power one has the more sense one can have of the difference between the specifically human and the generic meaning of “feeling”’ (261). The concept of video as a prehending subject can only be understood in terms of this language of events and the access to a generalizable concept of ‘feeling’ that moves beyond the framework of specifically human experience. Karl-Otto Götz, quoted in Mehring, ‘Television Art’s Abstract Starts,’ 33. See C. Greenberg, ‘Modernist Painting’, in C. Harrison and Paul Wood (eds), Art in Theory 1900–1910: An Anthology of Changing Ideas (Oxford: Blackwell, 1992), 754–60. O. Piene, ‘Paths to Paradise,’, in R. Wiehager (ed. 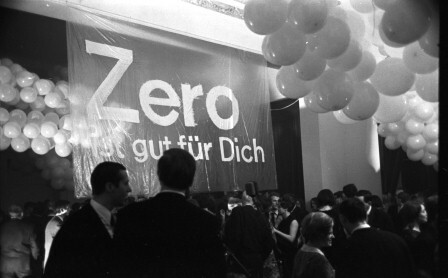 ), ZERO Aus Deutschland 1957 bis 1966: Und Heute (Ostfildern: Hatje Cantz, 2000), 235. Piene’s rhetoric is echoed by Lucio Fontana, who said in a 1962 interview that the colored plane represented ‘nothing less than suffocation, limit and restriction.’ Fontana, quoted in Mansoor, ‘Fontana’s Atomic Age Abstraction,’ 156. Piene, ‘What Is a Painting?’  in Wiehager (ed. ), ZERO Aus Deutschland, 127. H. Mack, ‘Resting Restlessness’  in Wiehager (ed. ), ZERO Aus Deutschland, 105. Mack, ‘The New Dynamic Structure’,  in Wiehager (ed. ), ZERO Aus Deutschland, 227. See N.J. Paik, ‘Versatile Color TV Synthesizer’, in J. Rosebush (ed. ), Nam June Paik: Videa ‘n’ Videology. Eric Siegel’s Processing Chrominance Synthesizer (PCS) was introduced in 1968, followed by his Electronic Video Synthesizer (EVS, 1970) and Dual Colorizer (1971). In 1970 Stephen Beck introduced his Direct Video Synthesizer. T. De Duve, Kant after Duchamp (Cambridge, MA: MIT Press, 1996), 147–66. E. Alliez and J.-C. Martin, The Brain-Eye: New Histories of Modern Painting, tr. R. Mackay (London: Rowman and Littlefield, 2015), 189–252. J.Y. Lettvin, H. R. Maturana, W. S. McCulloch, and W. H. Pitts, ‘What the Frog’s Eye Tells the Frog’s Brain’, in W.S. McCulloch, Embodiments of Mind (Cambridge, MA: MIT Press, 1988), 230–55. B. Viola, ‘Statements 1985,’ in Reasons for Knocking, 149. Heiner Stachelhaus has outlined the ambivalent relation to idealism within the Zero group. Piene’s idealist statements were countered by Mack, who did not want to associate their art with a line of thinking that, in his view, was already a philosophical failure. H. Stachelhaus, ZERO (Düsseldorf: Econ Verlag, 1993), 64–73. Aldo Tambellini, ‘An Autobiography’, in A. Tambellini, Black Zero, exhibition catalogue (New York: Boris Lurie Art Foundation/Chelsea Art Museum, 2011) 67. R. Hausmann, ‘Mélanographie’ , in A. Haus (ed. ), R. Hausmann: Kamerafotografien, 1927–1957 (Munich: Schirmer-Mosel, 1979),27–28. F. Fanon, Black Skin, White Masks, tr. C. L. Markmann (London: Pluto Press, 1986). USCO’s events took place from 1964 onward, and Exploding Plastic Inevitable took place in 1966/67. W. Grey Walter, quoted in J. Geiger, Chapel of Extreme Experience: A Short History of Stroboscopic Light and the Dream Machine (New York: Soft Skull Press, 2003), 14–27. Interestingly, the theme of darkness inserts itself into these investigations of stroboscopic effects. A Ray of Darkness was originally the title of a book by British poet Margiad Evans, in which she documented her life as an epileptic and the flicker treatments she received during the 1950s. Significantly, she describes the color experiences produced from flickering as different from those experienced in ‘normal’ seeing: these were distinctly ‘mental’ color, characterized by ‘activity and revolution’ rather than ‘glow.’ Evans, quoted in Geiger, Chapel of Extreme Experience, 22. PA: Bucknell University Press, 1996), 152–90. Tony Conrad, interview by John Geiger on February 28, 2002, http://www.tonyconrad.net. During his college years—around 1959—Conrad took courses in neurophysiology and neuroanatomy. One of the course topics was CFF—Flicker Fusion Frequency or Critical Flicker Frequency—that focused on parameters for investigating central nervous system events and activity. Research such as this should obviously also be seen in the context of the attempt by Warren McCulloch and Walter H. Pitts during the 1940s to understand neuronal activity in terms of logical calculus and more precisely binary notation. See, for instance, W.S. McCulloch and W. H. Pitts, ‘A Logical Calculus of the Ideas Immanent in Nervous Activity,’ In W.S. McCulloch, Embodiments of Mind (Cambridge, MA: MIT Press, 1988), 19–39. T. Terranova, Network Culture: Politics for the Information Age (London: Pluto Press, 2004), 30–35. Paik’s essay ‘Experiments in Electronic Pictures’ was originally published in Fylkingen Bulletin International (1967) and reprinted in Rosebush (ed. ), Videa ’n’ Videology. M.L. Eaton, Bio-Music (Barton, VT: Something Else Press, 1974). B.W. 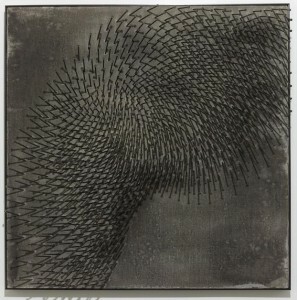 Joseph, ‘Biomusic’, Grey Room 45 (Fall 2011), 128–50. Paik and Abe, ‘Paik/Abe Video Synthesizer (Keyer & Colorizer) & Scan Modulator (a.k.a. the Wobbulator),’ in S. Vasulka, W. Vasulka, and P. Weibel (eds), Eigenwelt der Apparate-Welt: Pioneers of Electronic Art (Linz: Ars Electronica, 1992. Exhibition catalogue), 126–29. Grey Walter, quoted in Geiger, Chapel of Extreme Experience, 26. Mehring sees Black Gate’s self-enclosure as a complex realization of the formalist impulses in early television art, describing it as a ‘largely abstract artwork […] using the full possibilities of televisual form, production and reception.’ Mehring, ‘Television Art’s Abstract Starts,’ 61. This is no doubt correct, yet its relation to the history of flickering and psychophysiological modulation also opens its particular form of abstraction and closure to other readings. 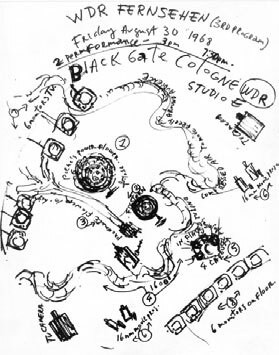 Here, Black Gate Cologne might be compared with Nam June Paik’s Video Commune (1970), another live studio broadcast where the concept of collective life is associated with a flickering pulsating media space grounded in a particular prehension of painting. This was the first public presentation of the possibilities of the Paik/Abe Video Synthesizer—an instrument set up to facilitate sophisticated scanning modulations. While Paik’s early video discourse contains multiple references to the possibilities of a radically temporalized painting, the introduction of the Video Synthesizer is the context in which Paik explicitly promotes the idea of an electronic update on painting. Nam June Paik, ‘Versatile Color TV Synthesizer,’ in Videa ’n’ Videology, unpaginated. Significantly, such references do not assert the purely optical dimension of painting, since Paik’s video discourse is entirely centered on the concept of haptic relations and even direct neuronal stimulation. S. Weber, Mass Mediauras: Form, Technics, Media (Stanford: Stanford University Press, 1996), 76–107. The key text here is Jürgen Habermas, Structural Transformation of the Public Sphere: An Inquiry into a Category of Bourgeois Society.